We've been on a dozen or more cruises - everything from small luxury yachts and mega ships to clipper ships and chartered barges but this trip was our first experience on an Expedition ship. Our packing list for this voyage included things we had never taken on any other cruise - waterproof gloves, rain pants and jacket, waterproof hiking boots, trekking poles, multiple pairs of wool socks and layers of wicking, breathable clothes. We had always wanted to experience an UnCruise and this year we were able to do it and I don't think it will be our last. UnCruise has been in business since 1996 and specializes in delivering big adventures to passengers on its fleet of small ships. Our voyage was aboard the Wilderness Discoverer - a sleek ship built for adventure and exploration at 176 feet in length and 39 feet wide. The ship was equipped with kayaks, paddle boards, inflatable skiffs, snorkel gear/wetsuits, two on-deck hot tubs, fitness equipment and yoga mats. The EZ Dock platform made launching kayaks a breeze. The interior of the ship was casual but well designed and comfortable. Our cabin had two twin beds, a large picture window, small bedside table and in-room sink. The combo shower/toilet room was small but manageable. The closet had plenty of room and there were lots of hooks to hang gear. There were also hooks outside of each cabin for guests to leave wet rain gear and jackets in the hallway along with hiking boots and rubber shoes. The public spaces were located on the Main Deck (Deck 2) and included the dining room, bar and lounge which had bookshelves loaded with books and DVDs to borrow. There was also plenty of deck space to catch some fresh air outside although it was mostly cold and rainy during our time aboard. The two hot tubs got a lot of use though. 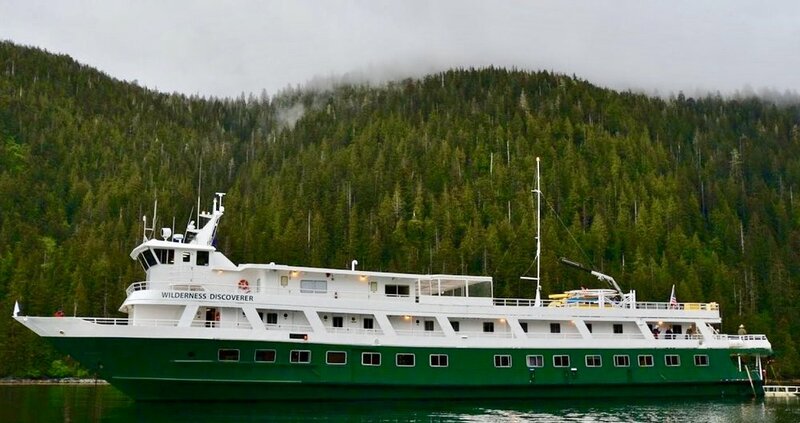 The Wilderness Discoverer can accommodate up to 76 guest and 27 crew. Most of the ship's 38 passenger cabins are located on the Observation Deck (Deck 3) with a few scattered below on the Main Deck. Four "Explorer" cabins located on the Sun Deck (Deck 4) were larger and featured a sitting area as well as a private bath with shower. These cabins seemed to be reserved for repeat guests who received them as upgrades. One couple we talked to who got the upgrade said they really preferred the cabins on the 3rd deck because of the interior hallway and being closer to the public areas. On embarkation day, we met up with other passengers at a downtown hotel in Seattle and waited to be shuttled to our ship docked at Fishermen’s Terminal. Upon arrival, we were greeted at the dock by members of the crew, expedition and hospitality teams and our Captain, Keith Raisch, a retired US Coast Guard Chief Warrant Officer. As we boarded the vessel we were welcomed with a glass of bubbly and then escorted to our cabin where our luggage had already been delivered. We quickly stowed our gear then went to explore the rest of the ship. Eventually we made our way back to the lounge and met some of our fellow passengers who were already bonding with perhaps the most popular crew member - the bartender, Jasmine. This particular cruise also had a craft beer theme so along for the voyage were Nate and Becca Schons, co-owners and brewers of Island Hoppin' Brewery. A selection of Nate's brews were available on tap at the bar and later in the week the Schons would be hosting us at their brewery on Orcas Island. Nate and Becca also made beer-pairing recommendations to go with each night's dinner menu. Plenty of options on a craft beer cruise. Bartender Jasmine was a mixologist extraordinaire! When all of the guests were settled in the lounge, we were introduced to the rest of the crew and guides along with our Expedition Leader, Sarah, who gave us a rundown of the next day's schedule and activity options. As Larry and I sipped on Nate's Bills Pills beer we listened to Sarah describe the list of skiff, kayak or hiking options we could sign up for the next day but she warned us, "There could always be changes based on the three W's - weather, whales and whims." At the time we didn't realize how foretelling those words would be. Shortly after the Captain and his crew set sail, dinner was served in the casual but well appointed dining room which served as the dining area for all meals onboard. Seating was open so each night we met new people from far and near - Brazil, Australia, Massachusetts, Texas and Seattle, to name of few places. We transited the Hiram M. Chittenden Locks while dining on the first of many delicious meals we would enjoy throughout the week. The full-service, sit-down dinners always included a starter, choice of a meat, seafood or vegetarian entree, two side dishes and dessert prepared by a dedicated pastry chef. Breakfast was always served buffet style as was lunch, unless on-shore activities were planned in which case we would take a packed lunch. It became the ritual each night, during happy hour guests would meet in the lounge to enjoy some appetizers while Sarah and the other guides would fill us in on the next day's plan and activities. On the first morning of the cruise we awoke anchored in the Salish Sea which is the intricate network of coastal waterways encompassing such major bodies of waters as the Strait of Georgia, Strait of Juan de Fuca and Puget Sound. Our morning consisted of a leisurely breakfast highlighted by fresh-baked Black Cherry & Hazelnut scones. Breakfast was followed by an orientation on how to properly wear a PFD (personal flotation device), procedures for boarding the skiffs that would shuttle us to shore for excursions and brief demos on kayak and SUP basics. Not long after the orientation it was announced that kayaking would be cancelled for the day due to high winds. While guests convened in the dining room for lunch, the expedition team convened with the captain to see what other activities were still possible. 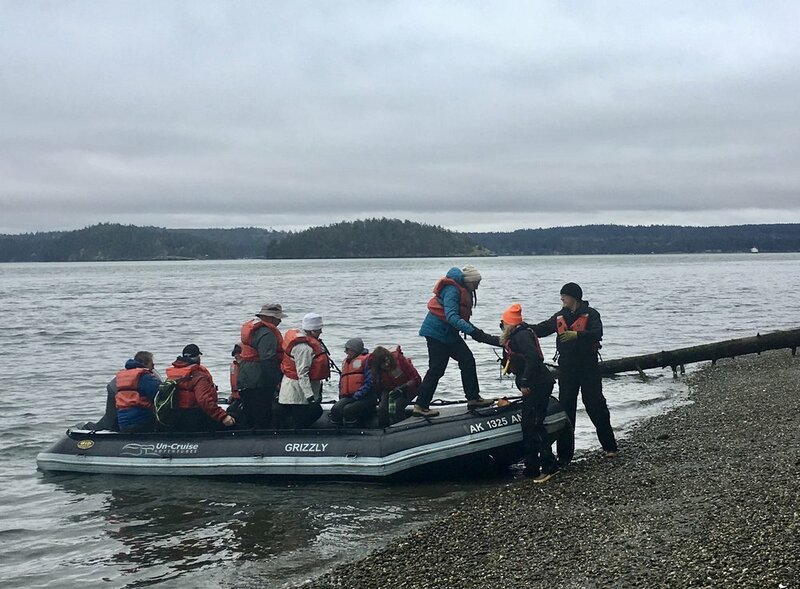 After lunch, we got word that the crew and expedition team would be able to launch skiffs and ferry us over to Whidbey Island for our originally planned afternoon hikes. The skiffs dropped us on shore at the point of the now defunct original ferry that back in the day had been operated by a cantankerous women named Berte Olson. As the story goes, patrons would summon the ferry by hitting a saw with mallet and Olson might come if she felt like it. Many of the trails on the island were the result of work carried out by the Civilian Conservation Corps from 1933 through the early 1940's. 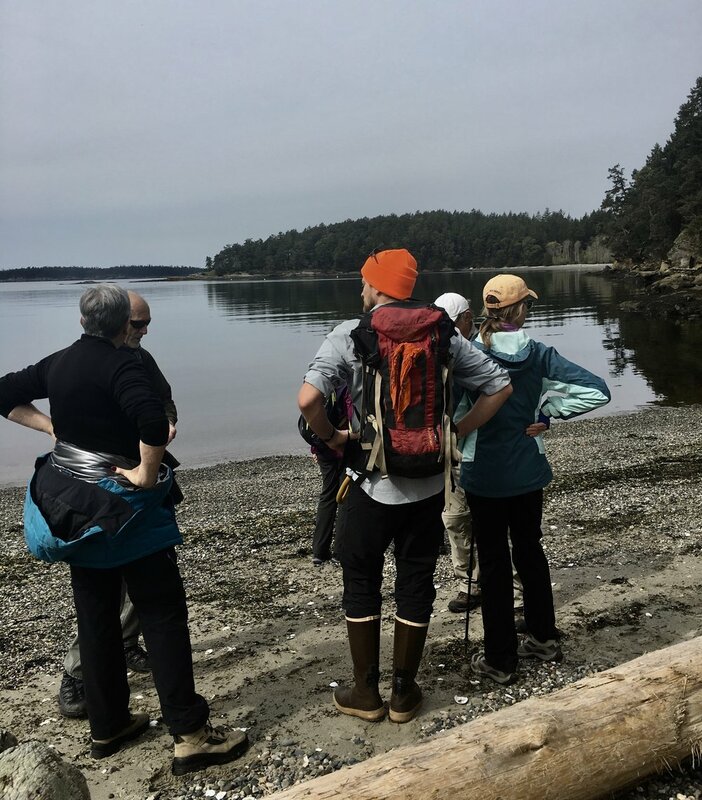 Our trail took us from the shoreline where we watched two bald eagles soaring overhead and a few harbor seals swimming in the water to a meandering path surrounded by old-growth forests and commanding views of the surrounding islands. Upon returning to the ship it was good news to hear the Captain had deemed it possible to sail through Deception Pass. Thankfully, Mother Nature was cooperating with us but she still had plans to throw us off course. Due to high winds after leaving Deception Pass the Captain decided to skip our scheduled stop at Lopez Island and headed for the more-sheltered Sucia Island instead. In the morning we woke up to find our vessel anchored in a quiet bay surrounded by sandstone bluffs and towering trees. Sucia Island is considered the "crown jewel" of the state marine parks system and is only accessible by watercraft. After breakfast we suited up for our first chance at kayaking. We shimmied into our kayak while on the EZ Dock platform and then the crew and expedition team slid us effortlessly into the pristine waters of Echo Bay. On our 2-hour paddle our guide, Karl, led us in the direction of some rocky bluffs where seals were known to hang out but once we entered the open waters it was a little too rough to continue. Instead, we ventured back into the calmer bay waters and explored the island's unique sandstone formations, quiet inlets and wildlife. After lunch we took a skiff from the ship to Fossil Bay and then hiked to the other side of this horseshoe-shaped island to Ewing Bay. We had great views of neighboring Orcas Island and its towering Mt. Constitution - the highest point in the San Juan Islands. The 3.5-mile hike took us along rocky shoreline, through old-growth forest and up bluffs overlooking emerald-green waters. It really was a breathtakingly beautiful island. After dinner, Nate gave us preview of what we would see and taste at Island Hoppin' Brewery the next day. It was great to him and Becca with us all week as co-hosts so guests could chat one-on-one with them. There were a few true beer aficionados on board including a beer writer and a beer competition judge. When asked about his approach to making beer Nate explained, "I have a vision of what I want a beer to be and then I work backwards into making it." Nate also piqued the interest of several beer enthusiasts when he told us about a beer we could try at his brewery the next day that is 8.3% ABV. 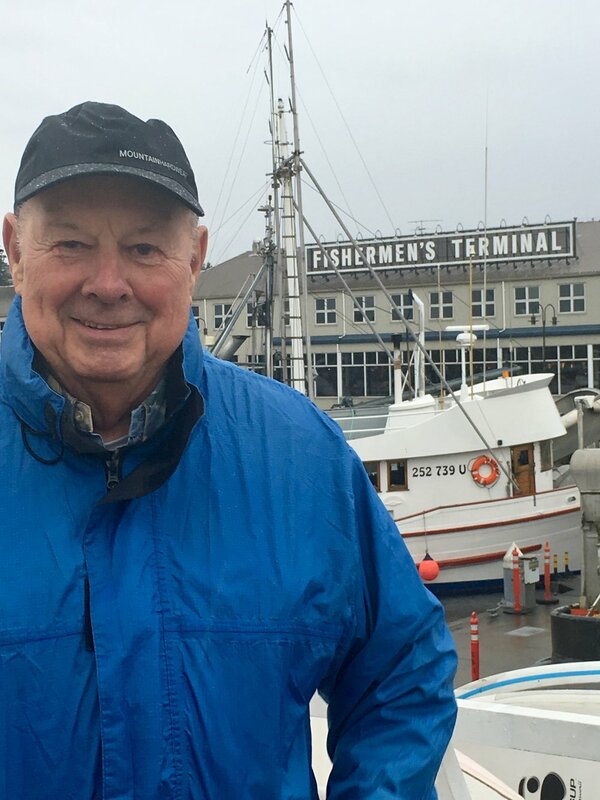 Gale warnings again forced the captain to change course from our planned itinerary of visiting Orcas Island and instead we docked in Friday Harbor on San Juan Island. Our visit to Nate's brewery would have to wait. While we were enjoying breakfast, the crew and expedition team had been hard at work putting together a new plan and Nate called a friend with a craft beer brewery on the island to see if he could host us in the afternoon. It is worth noting here how amazing the entire UnCruise team was. No matter what changes were presented to them the expedition team could seamlessly put a new plan in place with little disruption to the guests and the stewards of the hospitality team were always looking out for the comfort of guests. San Juan Island has an interesting history in that it was the last place of border dispute between the United States and Britain. The English Camp was on the forested north side of the island and the American Camp was on the south side. We were part of a group that shuttled to the south side to take a 3-mile hike on the Jakle's Lagoon Trail which at the start overlooked the Strait of Juan de Fuco and mainland Washington in the distance. It rained pretty good during our hike but we found some cover once we headed into the dense forest and miraculously the rain stopped and the sun peeked out just in time so we could enjoy our packed lunches sitting along the shore of a pretty cove. Back in town we visited The Whale Museum which opened in 1979 and was the first museum in the country devoted to a species living in the wild. It was a really well done museum with a mix of low- and high-tech exhibits and plenty of hands-on exhibits that kids would enjoy too. The museum is well known for its work in tracking generations of whales since the 1970's. 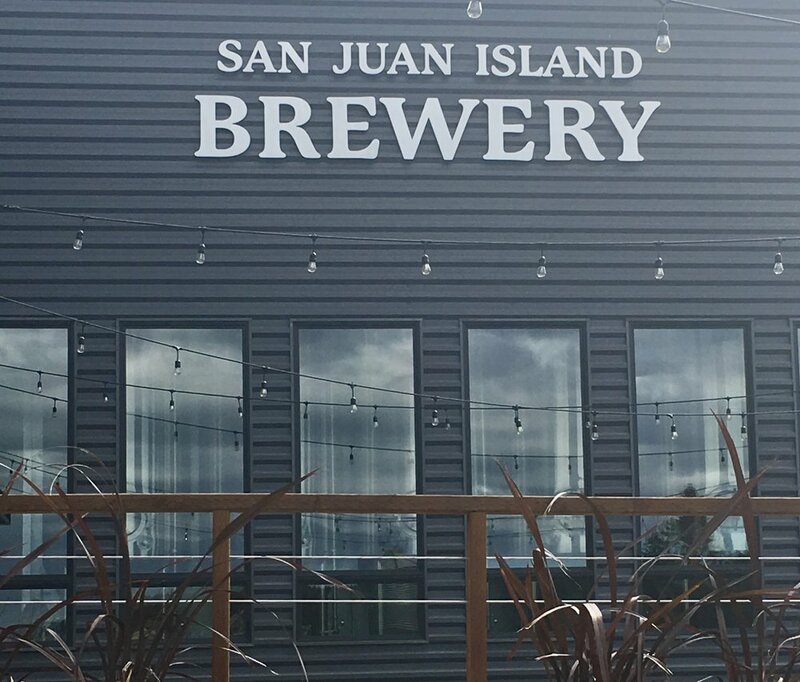 The rest of our afternoon was spent at the San Juan Island Brewery housed in a new $4-million facility just a few blocks from Friday Harbor. There was a nice, big deck out front which is probably packed on summer days but on this cold and drizzly day we headed inside. UnCruise had arranged to pick up the tab for our first pint or tasting flight of beer. Nate and Becca and some of the other passengers from the ship were already there and chatting with Nate's friend who owned the brewery. Larry and I both had the tasting flight which included pours of Golden Ale, IPA, Porter, Pale Ale and a Lager. The tasting notes were quite creative like the one for the Yachter's Daughter Helles Lager - Like the annual fair-weather flotilla of incoming recreational boaters. Dinner that night was "all-you-can-eat" crab and platters of it just kept coming as we cracked and picked our way through the tasty crustaceans. The beer pairing selected by Nate that night definitely added to the lively meal. We left Friday Harbor before sunrise and headed to Stuart Island (again, not on the original itinerary) where we dropped anchor. After breakfast we took a skiff tour where we saw some great bird life including cormorants, pigeon guillemots, belted kingfishers, bald eagles and harlequin ducks. Stuart Island is private so there were no hiking opportunities here. We could only admire the island from the skiff. When we returned to the ship the captain had been monitoring weather reports and the already pesky winds were forecasted to increase so once again, Mother Nature had upset our plans so off we went in search of calmer seas. We spent the rest of the day peering out the ship's large windows at the relentless white caps churning all around us as we headed for a protected cove. On the Wilderness Discoverer the bridge is always open to passengers so it was a popular spot to visit. The Captain and First Mate were very welcoming and generous with sharing their space and explaining the goings-on as they commanded the vessel against 44-knot winds. Eventually, the crew dropped anchor in West Sound off Orcas Island with a perfect view of Turtleback Mountain and that is where we remained for the rest of the day. The guides allowed some open-paddle kayaking for a few hours in the the vicinity of the ship but no other activities were planned for the rest of day so we played some cribbage and read in the lounge. This was a pretty restful day and we turned in early after dinner. As I was putting things away in the cabin before going to sleep I came across the original itinerary UnCruise had sent with our cruise documents. I turned to Larry and said, "You know, this really isn't an itinerary at all. It's merely a list of ideas, suggestions and possibilities." We had a good laugh as I tossed it in the trash. The captain repositioned the ship during the night so that when we awoke we were in West Sound directly in front of the Rosario Resort and Spa. This grand estate was part of the original private property of shipbuilder and former Seattle mayor, Robert Moran who had it built in 1906 as a place to escape the stress of work and city life. In 1920 Moran gifted a large portion of his property to the state of Washington after being inspired by his good friend, John Muir. (The Rosario Resort and Spa is still privately owned.) We had the opportunity to walk through the former mansion and admire the fine craftsmanship before boarding shuttles to take us to the trail head for our hike. Moran State Park has miles of hiking, biking and horseback riding trails but perhaps the most well known trail is to the summit of Mt. Constitution. In retrospect, Larry and I wished we had signed up for the summit hike but we opted for the shorter, 4-mile loop hike around a lake so we would have ample time to visit Nate and Becca's brewery later in the day. We ate lunch along the trail and then met up with our shuttle driver to take us to the summit of Mt. Constitution where we rendezvoused with the other hiking groups including the ones that hiked to the summit. I was disappointed because obviously there would have been plenty of time to hike the summit and visit the brewery. That was when I wished the guides would designate some hikes for faster walkers only. Sometimes it seemed like they made some hikes sound harder or longer than they were just to dissuade people from signing up and other hikes were set at very slow paces like our 4-mile loop. We were told during the orientation the summit hike could take up to 8 hours. That wasn't the case at all. In the afternoon we made our way to Island Hoppin' Brewery – Nate and Becca’s place, which is a little distance from the main part of town. UnCruise had arranged to have a shuttle make a loop to town, then the brewery and back to the dock so guests could come and go as they please. The brewery was located in an old metal shop in a little warehouse district. Nate built the interior of the brewery from the ground up. He initially wanted a smaller space but the owner of the building told him, "You're thinking too small." It was good advice because Nate already has plans to expand by knocking out some walls. When you enter the brewery you feel like you're walking into Nate and Becca's home. Island Hoppin' Brewery has much a different feel than the larger San Juan Brewery we had visited but that's what's great about craft brewing. The breweries are always a reflection of the owner/brewer. A group of locals were holding court at a corner table and behind them on the wall was one of Nate's guitars. I could just sense there had been some great impromptu nights in this place. Now in their sixth year of operation, Nate and Becca still enjoy a loyal following by locals who were there when they started. During the first two years Nate and Becca initiated a "Mug Club" for locals only. Members were vetted and had to be year-round residents in order to qualify for a coveted mug. The locals just grabbed their mug off the shelf when they entered and headed for the bar. They never had to wait. The brewery has two interior rooms that are cozy, quaint and perfect for easy conversation with others and the opportunity to make new friends. 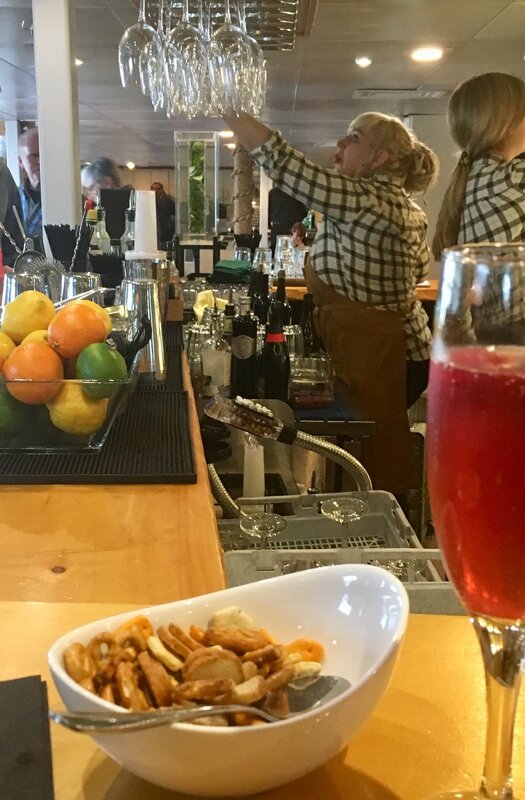 We were able to grab two stools at the modest-sized bar and tried some of the beers that were not offered on the taps aboard our ship, like the 8.2 ABV Old Madrona Imperial Red. 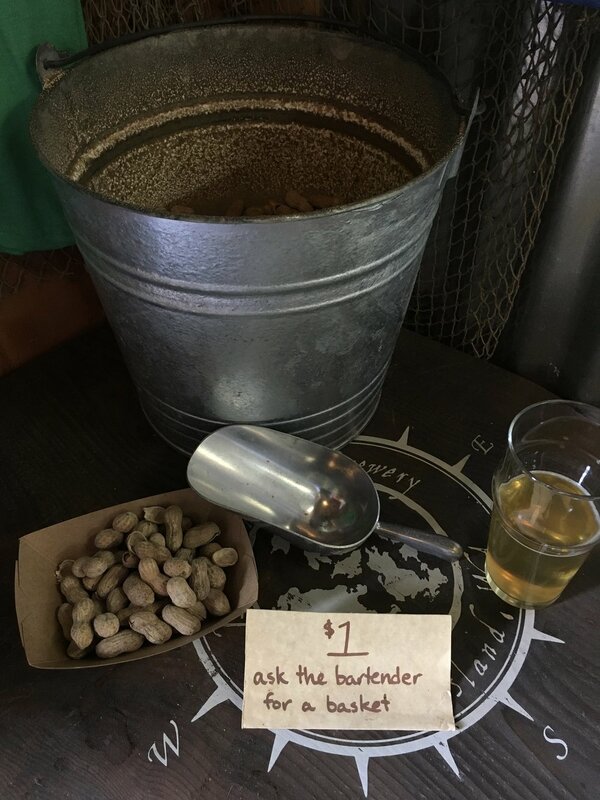 The bartender poured $5 pints, $2 tastes and $15 flights. We thought all of the beers were very good but we asked the opinion of the beer judge from our ship who was sitting next to us to get his professional opinion. He agreed. There were a few food options available for order and a help-yourself bucket of peanuts. Although somewhat tucked away and modest in size, this brewery was bursting with conversation and laughter and felt three times its size. Nate pointed to a stack of big boxes and said it was new furniture waiting to be unpacked and added to the outdoor area already decked out with picnic tables and a Ping-Pong table. The busy summer season would be starting in just a few weeks time. Island Hoppin' Brewery felt like the hub of the community. A place where everyone has to stop before heading home or back to the ship. We awoke this morning anchored off Port Townsend which is located on the northeast end of the Olympic Peninsula. A peek outside the window of our cabin revealed fog and rain. Not exactly ideal conditions for our planned hike. At one time, Port Townsend was speculated to become the largest harbor on the west coast of the United States but when the depression hit the city lost much of its funding to continue building rail lines so its importance diminished greatly. It began to flourish in the 1970's as new residents moved to the port city, including many retirees. Today, original Victoria-style buildings from the late-19th century now share the waterfront with restaurants, shops and theatres. Port Townsend plays host to many festivals, artists' conferences and other cultural programs throughout the year making it a popular tourism spot. At breakfast we sat with a couple from Seattle who said they planned to stay on the ship all day. "We see enough of this kind of weather in Seattle. I don't need to hike in it. " the woman told us. Several other guests were planning to skip the hike and just take the skiff into town for a little while or just stay on the ship. Hmmm, maybe they were right but, Larry and I are San Diegans who don't get to use our rain gear very often. So, off we went to our cabin to cram our day packs full of warm, waterproof gear. One thing we didn't have were backpack rain covers so we improvised with some garbage bags. We joined the other guests willing to brave the weather and boarded shuttle buses to take us to the trail head for our 6-mile hike. As we neared the drop-off point it became clear the road was washed out and so was the foot trail to reach the trail head. Our nimble guides scouted for another trail and then radioed the expedition leader and and support team with the back-up plan. With only a slight delay, we were soon hiking a path named "Dry Creek Trail" which seemed like a misnomer considering the lush terrain and constant rainfall puddling all around us. After hiking in the rain for about an hour and a half and with no guarantee of a spectacular view or summit on this unfamiliar trail, a few of us opted to turn back with one of the guides and catch a shuttle to go explore the town of Hoodsport before heading back to the ship. Nate and Becca had been on the hike and decided to turn back and head for Hoodsport too. We decided the best way to take the chill off was to visit the local distillery in town. The Hardware Distillery Company is located next to the Hood Canal in a quaint building constructed in 1930. The owners, Jan and Chuck, have occupied the space since 2012 and produce mead, vodka, gin, whiskey and Aquavit using honey, grains and fruit from the Washington area. The distillery's unique setting along the Hood Canal allows Chuck to age his barrels in the basement of the building and open up ventilation so the barrels can breathe in fresh, salt air. We tried at least dozen different blends as Chuck guided us through the tasting and explained the different distilling processes. The distillery was full of copper and stainless steel pots, stills, columns, etc. Chuck makes a variety of distilled meads under the "Bee's Knees" label. Distilled mead is made from 80% honey and 20% fruit. The liquid is aged in American Oak for about three months and then becomes a very unique spirit. His offerings include Peachy Keen, Raspberry, HWY 101, Merry Cherry with Coffee, Cat's Pajamas and Little Owl. We also enjoyed tasting the unique blends of Aquavit. We tasted the liquor ice cold, the way it's enjoyed in Sweden and raised our glasses - "Let's toast to life - Sköl!" We enjoyed one final breakfast with some of our new friends and exchanged contact information. Then is was time to catch a taxi to the airport for our early flight. UnCruise handled all transfers to the airport or city hotels. If passengers had early flights, the cruise was accommodating about setting up taxi or private shuttle service too. We would definitely book another UnCruise. We loved the mix of scenery, activity and relaxation aboard the Wilderness Discoverer. The entire staff was first rate and meals were very good. 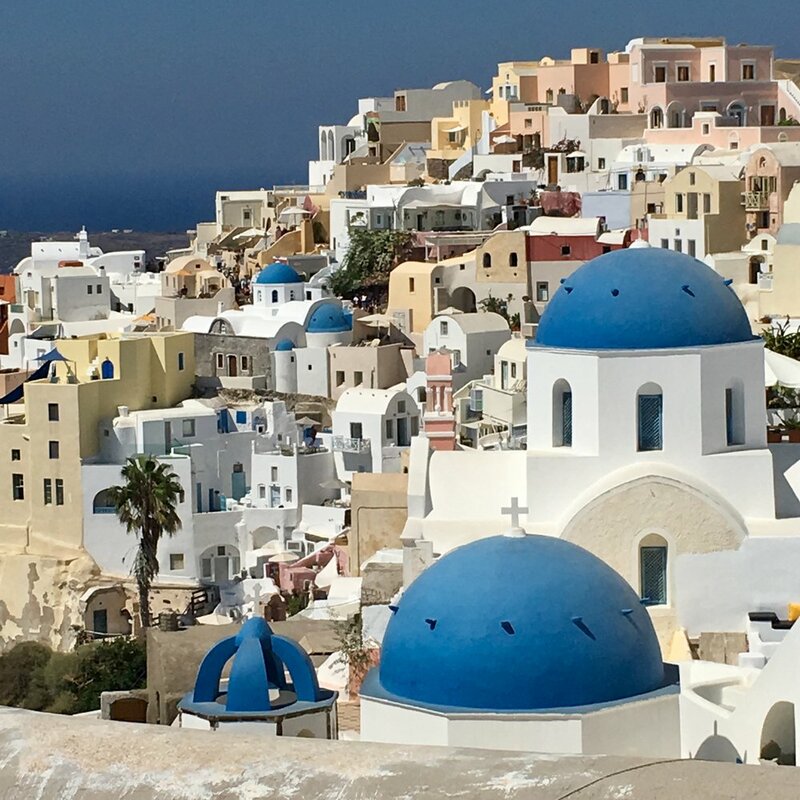 If you are interested in booking a trip with UnCruise or would like to get more details about our trip, please contact us. or 858-488-2569. Or click here. Disclaimer: As a travel agent, Larry received a reduced rate for this cruise but there was no compensation provided in exchange for editorial coverage. All opinions are our own and all content on Putnam Travels Blog is for informational purposes only. We are not liable for any errors or omissions in this information and accept no responsibility for any damages or losses arising in connection with the use of this website. Links directing to third-party websites are for informational purposes only and serve as a resource to the reader. We do not accept responsibility for the content of these sites or liability from use of them. Not sure what to pack? Click here for a Pacific Northwest Packing List. Our subscribers mean the world to us. as a subscriber you'll get exclusive content, be eligible for special travel savings and giveaways and receive our monthly newsletter.